Well, here it is! Time for my Week 1 collage. It was easy this week - I pretty much stayed in the house, so the hard part was coming up with ideas/enough lighting to take pictures. 1. Water drops on our blue spruce. It thawed over New Year's. 3. Snowflake sticker on my kitchen window... and the snow is back. 4. Me and my baby girl. 6. One of the many many lego trucks living here. 7. Shrug I'm knitting for myself - love chocolate brown!! I wish I was that awesome, seriously. I love your collage. That raindrop photo is awesome. Great photos. Blogger is easier, but I am getting used to wordpress. Wordpress is much more customizable. I love the water drops on the spruce. Very creative. 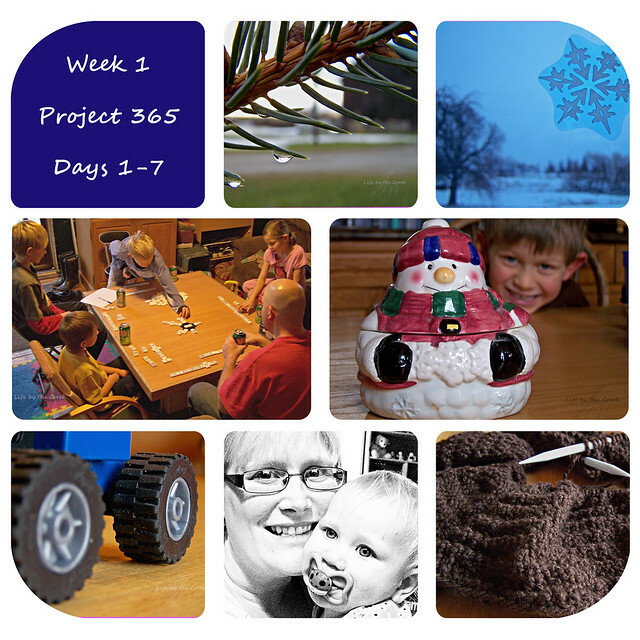 Your 365 collage is so wintery! That's really awesome. Can I join in a week late? It wouldn't be project 365, it would be project 358 or something... does that still count? Love your collage! The shrug is beautiful. I love the lego truck picture! I'm doing a 365 too, but I'm just putting it on my flickr and I haven't got them all online yet. I love that snowflake sticker photo! So clever! I love the chocolate brown shrug! These are all wonderful!!! Love the legos! :-D We have lots of those too, but no boys! Unbelievable able, right? Love the black and white also. Great shots! I love the detail in the first one!